This is part one of a series of articles about GO service expansions to the Hamilton area. As a Ward 3 resident in Hamilton, I commute daily on GO to Toronto. Thus, I spend time researching GO's future plans relating to Hamilton. Many locals are not aware of the exact specific details of GO's ongoing ten-year expansion plan for the greater Hamilton area. This 3-part special feature aims to change that. For over two decades, Hamilton has been promised all-day two-way GO train service, with many broken promises. Understandably, many Hamiltonians are skeptical of GO expansion promises. Finally, action is occurring at several Hamilton construction sites. Metrolinx is currently embarking on a ten-year plan called GO Regional Express Rail (RER). Part of this plan includes bringing faster electrified 15-minute all-day two-way service all the way to Burlington/Aldershot. The number of GO train trips will quadruple from 1500 trains per week to 6000 trains per week, in the next 10 years. Over two hundred GO projects are currently under way towards improved GO service, GTHA-wide. With the additional infrastructure, we will witness continued gradual incremental increase in Hamilton GO service, and within ten years to all-day Hamilton GO service. The lower frequency for Hamilton than Burlington is because Metrolinx owns the railroad only up to Burlington. This creates major difficulty providing frequent fast electric train service beyond Burlington due to track sharing with CN and/or CP. In addition, the Bayview junction in Hamilton is one of Canada's busiest freight junctions, and is not for sale to Metrolinx for GO use. In July 2015, West Harbour GO station partially opened on time for Pan Am Games, with limited initial service (6:16am and 6:46am trains). However, the station is destined for far more. The secondary phase of construction for West Harbour continues until 2017. The station is still undergoing construction for future service expansion, with a parking garage. Phase 2 construction of West Harbor has begun, and is ongoing until 2017 to complete the Bay pedestrian access, as well as a parking garage. As 2016-2017 comes, a sloping car ramp from James St N will access a Kiss'n'Ride and a 300-car parking garage. An additional access will be available on Tiffany St. as well. There will be room for additional surface parking accessible from Hess St N and Caroline St N, and is also a site for a possible second parking garage should it someday become necessary. The funded work also includes turning West Harbour station into a "through station" by 2016, rather than a dead end spur. One reason is to allow trains to access the Lewis GO Layover Facility being completed 2016. However, this also opens the door to Niagara Summer Seasonal GO service easily stopping in Hamilton possibly as early as 2016 or 2017. Until parking is available, many western Hamilton residents still prefer driving to Aldershot GO, especially considering their availability of all-day trains. With additional parking and additional trains, far more people will be using West Harbour GO. The A-Line Express bus from the mountain also accesses West Harbour GO, and will eventually be replaced over time with the A-Line LRT. This will gradually reduce the need to drive to the GO station as well. The station is also very pedestrian accessible, being on the edge of Hamilton Downtown. A Stoney Creek GO station was proposed as early as 2010, and a preliminary plan was published in 2011. A few years ago, Metrolinx purchased the Pines Motel across from the Walmart off Centennial Parkway. As of May 26, 2015, the Stoney Creek GO station is now funded. The funded $150 million budget includes $35 million for the station and $115 for rail infrastructure, including additional track between West Harbour and Stoney Creek GO, as well as ongoing bridge construction. Today, prep work partially funded by Metrolinx is currently ongoing. This is occurring in the form of the Centennial Parkway rail bridge reconstruction. The old 1929 bridge was becoming structurally unsound, which necessitated a bridge rebuild. Centennial Parkway has been temporarily redirected up to a surface crossing over the railroad, while the bridge is being demolished and rebuilt into a pair of new railroad spans. The new rail overpasses currently under construction, will incorporate room for up to 4 tracks, and space for a GO platform in the middle of the rail bridge, as part of the upcoming Stoney Creek GO station. By summer 2016, a second bridge span will be built in the place of the 1929 bridge. Both bridge spans will have room for four tracks and a GO platform in the middle of the bridge. These new rail bridges set the stage for the start of Stoney Creek GO station construction in 2017. GO requires a new location to park trains overnight before beginning Hamilton morning service. This is the Lewis Road Train Layover Facility. Metrolinx purchased land at Lewis Road for a layover yard for four GO trains and room for GO maintenance facilities. There is enough land to be expandable up to eight tracks (Niagara study, p. 5) that could be electrified (electrification concept, p. 93, section 5.8.3). However, these additional elements are currently unfunded. This facility will initially have four tracks for diesel GO trains. The facility becomes operational by the end of this year, and construction will wrap up in 2016. Land space for possible future expansion to 8 tracks (unfunded). Rail service had a long and good heyday in Hamilton, even including fast express trains to Toronto. However, after World War II, rail service to Hamilton gradually got decimated, until CN/CP and TH&B discontinued passenger trains. After VIA relocated train service to Aldershot, GO became the only train service available to Hamilton. For over twenty years, there were many broken promises by past governments to bring all-day GO service to Hamilton. However, this is finally changing. The multiple concurrent construction sites show that Metrolinx has finally started major investments in Hamilton towards extending more Lakeshore West service to the southern side of the Golden Horseshoe. Okay, but WHEN is all-day two-way service REALLY coming? The short answer: Over the next ten years. The long answer: We can only speculate on specifics. Metrolinx has set a ten-year deadline for their Hamilton RER service concept of hourly service. However, the first small incremental step will likely occur far before then. Metrolinx has a long tradition of incremental services increases. That said, there is a very realistic and sensible observation of a low-lying apple, for a first incremental step. The existing Niagara Seasonal GO train already passes West Harbour GO station today without stopping. The ongoing work makes it possible for it to stop in Hamilton sooner. This could bring summer weekend all-day two-way service (once every few hours) to both Toronto and Niagara Falls, with 16 existing trains per weekend (8 per direction). As part of existing construction plans, West Harbour becomes a bidirectional station instead of a dead-end track terminus (ongoing, 2015-2017). The date of completion (2015-2016) of the Lewis Road GO Layover Facility makes it useful for West Harbour GO to become a non-dead-end station. 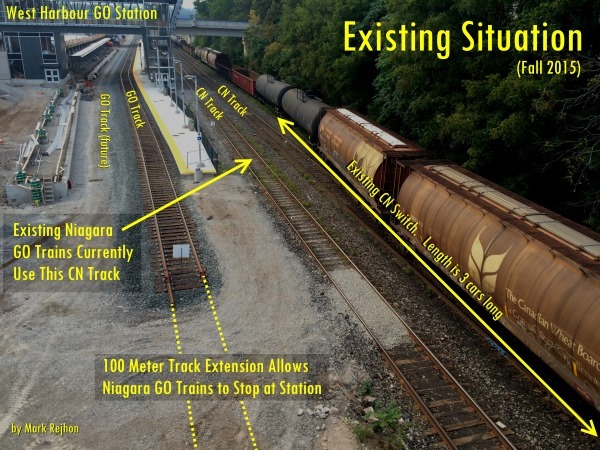 This theoretically makes it easy for the existing Niagara train to stop at West Harbour GO. In terms of including West Harbour GO Station as part of Niagara seasonal service, the infrastructure required to transfer trains from the rail corridor in Hamilton to the corridor used to get to Niagara (both of which are not owned by Metrolinx) is part of a secondary phase of construction at West Harbour GO Station. This next phase of construction is expected to begin later in 2015. Please note the planning for our 2016 service is ongoing and the details are yet to be determined. We expect that complete information will be available by Spring 2016. While very promising from an infrastructural point of view, it is worth noting that this is not a definitive confirmation of Niagara Seasonal service. It is generally observed that Metrolinx takes longer than expected to complete many service increases, with the complexities of inter-agency co-operation in construction. This happened with the Lakeshore West 30-minute service upgrade, which finally occurred in 2013, several years late. However, occasionally, good news do occur unexpectedly. The Kitchener/Stoufville lines are reportedly getting hourly all-day service this September to Mount Pleasant and Unionville stations. This is actually one of the biggest GO service expansions since the Lakeshore hourly all-day service began! This is unexpected as Metrolinx does not own the railroad through Brampton. Hourly all-day two-way off-peak service to Mount Pleasant is not even shown in the Kitchener RER roadmap. It appears that unexpected service improvements occasionally occur in lieu of the norm of delayed service improvements. It is possible that negotiations with freight companies can go well, and sometimes service is introduced sooner on freight-owned trackage. Currently, we are working with CN and the City of Hamilton to develop the infrastructure requirements and staging plan to introduce increased levels of service in Hamilton beyond 2015. Negotiations are underway with CN to secure access to the rail tracks to finalize the number and timing of trains. Those negotiations are progressing well. That said, Metrolinx cannot confirm specifics about negotiation with freight companies. Time will tell if the tentatively positive words from Metrolinx boil into additional trains. It is worth noting late trains from Hamilton, delayed by freight trains, can have major cascading effects on station timetables for everyone else down the Lakeshore line. We can hope negotiations go well enough that GO can comfortably ramp up all-day two-way service to Hamilton sooner than 10 years, even if not all the way to hourly at first. On the other hand, plans can change rather quickly with budget cuts of a future change of government. Fortunately, West Harbour GO and Lewis Road GO Facility is essentially a cat already in the bag, and Stoney Creek GO station construction should be well under way before election time. By then, Hamilton will already have GO infrastructure flexibility for service expansions. Metrolinx has been researching electrification all the way to Hamilton. While this is not part of the current ten-year GO RER plan, several recent observations can be made. Metrolinx did a conceptual design study on electrification all the way to the Lewis GO Layover Facility, including checking bridge clearances, power substation locations, etc. Freight ownership of tracks can affect the timing of any possible electrification to Hamilton. It is observed that diesel freight trains do run underneath electric catenary in many countries already, so it is technically possible without full track ownership. While there is a desire to eventually electrify to Hamilton, it is important to note that this is not currently funded or scheduled yet. Why are there two downtown GO stations? This is a common question. Both Hamilton GO station and West Harbour GO stations have separate pros/cons that warrant keeping both of them concurrently, for the time being. For example, drivers will find it easier to park at West Harbour GO, while downtowners and B-Line users will find it easier to go to Hamilton GO. 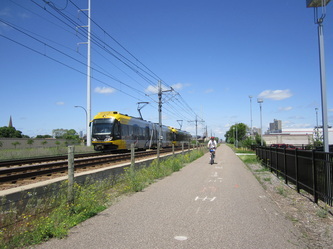 As GO extends Lakeshore West rail service in the future, the role of West Harbour GO could become increasingly important as time passes. The current announced plan is for hourly all-day train service to Hamilton downtown GO station, rather than West Harbour. However, the role of West Harbour is not necessarily set in stone. It can potentially eventually change to become the all-day service station instead, perhaps once the LRT is built, if favourable to do so. There is more servicing space at the Lewis Road Layover Facility to expand with, which may affect future decision on station role changes. There is also the proposed year-round GO train service to Niagara Falls, upgrading the seasonal service into a year-round commuter service. Other service concepts such as Niagara Express turns West Harbour GO into an important interchange station between the Toronto trains and Niagara trains. The latter idea is a creative means of protecting Lakeshore West trains from being impacted by delays at Welland Canal. Implementation of any of these ideas will modify the importance of West Harbour GO. Additionally, it may turn out that negotiating with one of the freight companies (CN versus CP) may end up easier than the other. It appears having both stations permits Metrolinx to hedge bets for service expansion to Hamilton, since the Hamilton freight tracks is not currently for sale. In any case, it is possible one station will have peak service, and the other station will have all-day service. It is also possible roles can reverse later on, given the upcoming A-Line LRT, and Hamilton waterfront redevelopment potentially creating a new CBD for commuters. 30-minute all day service on Lakeshore lines (weekdays 2013, weekends 2014). Georgetown Corridor Project (grade-separations, mostly complete 2015). New GO stations, including Caledonia GO and future infill stations (e.g. SmartTrack). GO Regional Express Rail (RER) (ten-year plan) to bring faster electrified 15-minute all-day two-way service all the way to Burlington (and possibly eventually to Hamilton). Union-Pearson Express (airport train completed in 2015). Several LRTs being built, including ION LRT (Kitchener-Waterloo, 2017), Confederation LRT (Ottawa, 2018), and Eglinton Crosstown LRT (Toronto, 2023). Many other LRTs including Hurontario LRT, Finch West LRT, Sheppard East LRT. VIA Rail expansions, including extra service to London and Sarnia. Funding awarded for studies of possible future megaprojects, including High Speed Rail study and Freight Bypass study (frees up freight tracks for use by GO). Even if half of these become postponed or cancelled, this is still a de facto rail renaissance well under way by North American standards. This is all across-the-board. It makes sense for Hamilton to be included, rather than be left behind. In the next ten years, with LRT and GO expansions, Hamilton will finally become a commute destination, and we will be fully connected to the rest of GTHA's rail network. With downtown and waterfront revitalization ongoing, and expansion in Hamilton jobs, Hamilton will become an even more attractive place to start up a large business. Outside commuters can now be able to come into town by GO train, not just by car. With two-way service, Hamilton finally becomes a viable GO commute destination, rather than a bedroom community. Friends and family will be able to easily visit Hamilton by train far more quickly rather than having to transfer to a GO bus at Aldershot. The Aldershot bus transfer often adds 30-60 minutes more to the journey time, depending whether the bus was missed or became full. Not everyone has access to the Hamilton #16 Express GO bus. As a result, friends and family without cars along the Lakeshore lines, do not visit Hamilton as often as they could with predictable all-day GO train service. With additional station parking and service, a portion of Mountain commuters will choose to park at West Harbour GO and Stoney Creek GO, rather than always driving further on congested freeways to Aldershot GO or Burlington GO. New feeder bus routes, and possible future Mountain LRTs, will emerge to serve all GO stations, making it easier for our kid's families to share fewer cars and save money. Future McMaster students can look forward to GO expansion. After some weekends, I witness well over 200 student-aged passengers with backpacks disembark a single off-peak train at Aldershot GO. Students will be able to stay on the train into Hamilton rather than having to get off one stop early. Student use of GO would also increase even further. We welcome all the concurrent genuine shovels going on at Hamilton GO construction sites, working to prepare for Hamilton's future growth in GO service. Great overview. Thx for all the helpful info. Will certainly feel like a giant step into the future when our first LRT line is up and running alongside these new GO Stations with more frequent service. I've also heard rumblings from Brantford about their desire to see GO Buses coming into Hamilton daily due to the increasing number of commuters who travel from Brant to Hamilton each day. Would be great to see us become a destination city in the GO network. I'm the writer of this, spent two weeks on this article. I have a Part 2 and a Part 3 under construction; the next part will be about the Niagara Seasonal Service stopping in Hamilton, that is apparently technically possible far earlier than 2019 because of existing fully-funded construction turning West Harbour into a through-station sooner. Keep Tuned! "CN owns the corridor west of Burlington and operates it as a main freight line, and CP owns the corridor into the Hamilton GO Centre; this will drive infrastructure requirements and the timing of electrification"
This lack of track ownership is a serious limitation for service expansion. Without electrification or right of way on the tracks the leg from Hamilton to Burlington will always be slow and fraught with delays. When I lived in Hamilton I was closer to the Hunter station but I drove to Burlington instead. The extra 10 minute drive saved me 5-10 minutes overall. And with the service upgrades I will have oodles of trains to catch from Burlington - I won't ever have to race for a train again. We can do reliable 60-minute two-way all-day on what looks like the current funded path. Some sections of additonal track is apparently planned. There are several environmental assessments under way to add additional track between Burlington and Aldershot, as well as additional track between West Harbour and the Hamilton/Bayview Junction. These piecemeal upgrades will greatly decrease contention between GO trains and freight trains. Additionally, West Harbour itself acts as a convenient siding for GO trains, as freight trains can pass while GO trains are picking up passengers. All these combined, will reduce delays. I will dig up links/references to appropriate Metrolinx/GO PDF files later; but all of these are the lowest-lying apples in incremental improvement of the Aldershot-Hamilton connection. A single rail-to-rail grade separations costing in neighbourhood of 150-200+ million dollars, minimum. Due to the complexity of the lake curve and the Lake Ontario enbankment, I'd wager it could even cost double that. Metrolinx has been adding rail-rail grade separations gradually over the years to the GO network, especially most recently in the Georgetown Corridor. There was another Metrolinx PDF that studied 60-minute and 30-minute scenarios with/without this rail grade separation, and it was found that it was infeasible to do reliable 30-minute service (without too many delays) at current budgets at this time; I will try to dig up the exact PDF -- or it will be incorporated into one of the next articles. Very interesting article. I like it when timelines are 'present day' rather than Jetson's dates like 2035! I wonder if it is reasonable to keep the Hunter St station after the LRT branch to West Harbour is built? It just seems to be naturally bypassed by West Harbour which can seamlessly continue on to Niagara and also by Aldershot which could run up to Brantford and beyond. Hope the parking garage at WH will have charging stations. Even as early as 2012 it was reported that Phase 2 construction of West Harbour would take until 2017. This is nothing new. But we did accelerate a portion of the construction to make the station partially open on time for PanAm. Mainstream news sources often did not always report the 2017 "Phase 2" date that many people like me already knew. Does anyone know what if any are realistic projections of train service/ frequency to the GO station in Stoney Creek? Is all-day two way to the Stoney Creek station included in the 10 year plan? I'm looking forward to the day where I don't have to drive to Burlington GO station, and/or the day they increase GO bus service to the Burlington station to every half hour/ 15 minutes to be consistent with train service to and from Toronto. Currently, we can only speculate without a B-Line LRT extension to Stoney Creek. It will almost certainly be peak only at first. 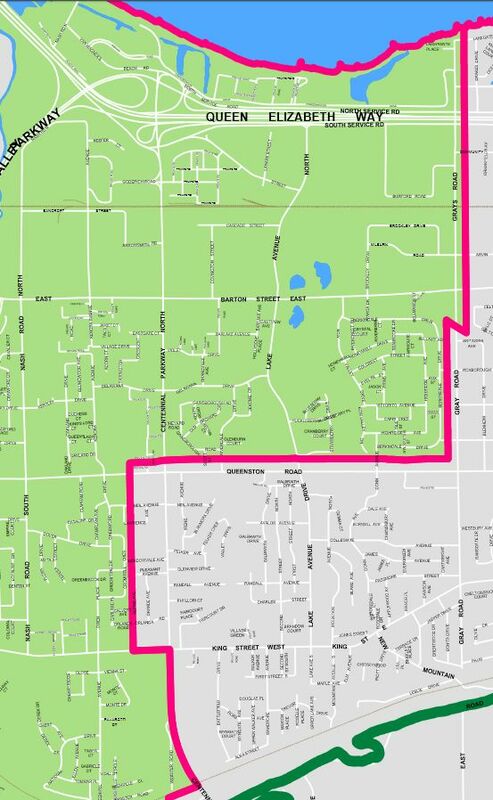 However, I have great information about future Stoney Creek possibilities (mostly speculations, but realistic under a generation) in Part #3, though some content may shift to Part #2. I'll echo what others have already said. Great piece. It's good to have a summary and analysis like this of the various plans. Thanks for doing it. Great work, for sure. Well done, Mark! Thanks. Extremely detailed and insightful article, particularly on the ownership of rail tracks impacting frequency of GO service in Hamilton. I know the answer already but any chance CP/CN would consider selling tracks or have access agreement? Keep tuned for Part #3. I cover this angle in Part 3 of the special feature series, with references to existing Metrolinx/GO research and studies, as well as alternate solutions (parallel trackage) that were proposed, some funded, and some unfunded. For example, the announced $150M Stoney Creek GO fund includes parallel track between West Harbour GO and Stoney Creek GO. any chance while we're adding parallel tracks that we could add cycling pathways?? I've long looked at our CN land below the bridges in the north end and envisioned a bike/pedestrian path from Queen St/waterfront trail right over to Woodward Waterworks plant and Red Hill Valley Trail over the QEW to the lake. Nice work Mark - as a neighbour of the WH GO I have been a little disappointed with service levels after Pan Am, and am happy to see this explanation of the long-term plan. As you say, the junction will be the real stumbling block to electrification. I do hope they figure that out, and opt to go with EMU trains as opposed to just electric locomotives so we can see a significant travel time benefit. On a helpful note, a recent non-stop PanAm West Harbour express made it between Union GO and West Harbour in a mere 47 minutes. It was a very late departing train, departing Union almost 30 minutes late, but made it nearly on time! A GO train driver (vegata_skyline on UrbanToronto) agreed it was a record for a 12-car bilevel diesel GO train Union-Hamilton. The amazing story of this rocket-powered July 2015 GO train is explained in UrbanToronto post1, post2, part3. This spetacularly fast GO train portends the potential of fast service (without needing to increase railroad speed limits) if we had electrification someday. This GO train roared past Burlington in only 30 minutes after Union. That's faster than the normal timetable for arriving at Oakville! In some sections, the train ran at near 90mph (143kph) through multiple consecutive stations, the maximum allowable speed for a green bi-level GO train. Ironically, it's not an all-time record, just only for the bilevels. A rail veteran tells me this is similar to the regularly scheduled timetable of a 1940s Toronto express train, which was under an hour or so in the olden days. Doubtful we will see nonstop express trains anytime again in the near future, but it shows it can be achieved without increases in rail speed limits (albiet a busy corridor makes this very hard). That said, it is worth noting that the Niagara summer seasonal passes West Harbour about 55 minutes after it departs Union, thanks to its more-express-than-weekday-peak-Oakville-expresses nature. This is competitive to the Hamilton 16 express on an average-traffic day. Except the article explained in pretty good detail how EMU to Hamilton is a bit of a pipe-dream right now because GO can't convert our leg of the track to electric, or am I missing something? The article and several comments noted challenges related to electrification to Hamilton. What you are missing is the key difference in train tech in the chart above (that I admittedly didn't explain) - one option is to use existing bi-level coaches pulled by an electric locomotive (one electric motor) for a 6-7 min travel time savings, a second is to buy all new Electric Multiple Units (EMUs, where each car has an electric motor) for 16-17 min off the trip time. The acknowledged challenges involved related to the junction/track ownership do not change my desire for the latter to occur. That said, it appears The Toronto Star may have been a bit early on the Stoufville line hourly service, which isn't part of the September schedule change. Let me get this straight. After 20 years of planning we make a new 10 year plan. Maybe my great grandchildren will be able to ride the train to Union. What's different this time, is there's actually construction. "Rail service had a long and good heyday in Hamilton, even including fast express trains to Toronto. However, after World War II, rail service to Hamilton gradually got decimated, until CN/CP and TH&B discontinued passenger trains. " Hey, you found my website! Excellent comment. I'll try to incorporate this information into one of the future articles (Part 3 possibly) since Part 3 covers far-future stuff like these. Personally, I think the first real-life Hamilton commuter rail network will possibly begin with West Harbour GO + Gage GO + Stoney Creek GO. Although Gage GO possibly is not even studied (yet) by Metrolinx, Hamilton owns land there now, and it'd allow access to the stadium and Gage Park megaevents (like World Music Festival), and possible business revitalizations over the next two decades in the gritty areas surrounding Gage GO. And consider LRT connections could cause a transit loop to emerge (GO line, A line, B line, all creating a loop); transit loops are often an extremely powerful coming-of-age moments for a nascent rail transit network. This type of thing is "for our kids" kind of thing, but all of our now-funded projects actually already gets 80% of this transit loop ready. OK, all this means is no jobs in this city. Yes being educated truly means you are wiser, right!!! Hamilton's jobless rate has fallen quite a bit, to 5.3 percent right now. Great article. This is about as comprehensive as it gets. The downtown Hamilton GO Centre provides a very direct connection to city bus services along multiple routes (which could be vastly improved, especially the current A-Line express), and connections to regional inter-city buses, so there should be a good market for hourly or better GO train service there (and if they can resolve the Hunter St. tunnel issue that will ease any train congestion problems). The West Harbour station provides an alternative, with the future connections eastward into Stoney Creek and the Niagara Peninsula. But it will take time for ridership to justify many trains beyond Hamilton, especially until the train can rival the speed of QEW bus connections to Burlington. Maybe the Niagara business case will be advanced, but as a Lakeshore West user I read far too many "service updates" for the summer Niagara Falls trains where they're held up at the Welland Canal, so I don't know if regular service can match what buses can currently provide, at least not more than a few peak period trains per day. However it plays out, it's great to finally see train service being prioritized in the Hamilton area. Positive Train Control (trains will automatically brake before danger). Metrolinx has been slowly and surely steadily working on all the above elements. They bought the core network and are adding grade separations, and some EAs mention Positive Train Control systems. At some point, the GO network would be a bona-fide surface subway almost completely separate from the Canadian railroad network (except for through VIA trains and the nighttime freight train with running rights). At this stage, the network is safe enough to permit light trains -- like those Stadler KISS electric trains not currently allowed to run on Canadian railroads. Incidentally, Stadler KISS is the model of the electric train teased at West Harbour / Stoney Creek GO. This will be much easier on trackage that is owned by Metrolinx (and planned for electrification). It would be much, much harder to get Transport Canada approval for EMUs between Burlington and Hamilton, but it wasn't a "AND" for all the three of the above bullets; and things like full grade separations & positive train control might eventually be able to satisfy Transport Canada in allowing EMUs to run the "rest of the way" to Hamilton. We can only speculate at this time. Transport Canada cuts would certainly factor into all of this. RER approval would be a rather big ask that by mere inquiry alone, would literally demand the Federal Government to increase Transport Canada funding to service such a "big ask" from Metrolinx. GTHA is literally a quarter of Canada right there. We have an election this October and some of the governments are more/less rail friendly than others. My expectations are locomotive-driven bilevels would run on Lakeshore lines, as EMU acceleration is not as necessary with the large stop spacings currently on the Lakeshore lines. However, for the infill station density of SmartTrack (simply an enhanced/merged/densified GO RER Kitchener/Stoufville), the use of EMUs would be useful. GO still has lots of bilevels on order, and while all of them will be used up during GO expansions, we'll still need EMUs too. But possibly not on all routes. On this subject, Metrolinx sent out an RFI on the MERX tendering system, for EMUs, electric locomotives, and dual-mode hybrid locomotives. Still wish they had put a stop at Gage Ave, not only for easier access to Tim Horton's Field, but various festivals at Gage Park as well. It really is a region of the city that would benefit and encourage intensification with a station there. The Gage GO idea is part of the GO special feature Part #3. This station is unplanned/unfunded, but the city purchased land next to the railroad there -- The land is already a cat in the bag; we are now already protected for that possibility, should it happen. A temporary basic asphalt platform (without shelter) can cost well under $1M (1/50th the cost of West Harbour); something that could be potentially locally raised. We don't need underpasses/overpasses, since Gage Rd can be used as the pedestrian crossing. It is additionally noteworthy Toronto is possibly doing the Olympics 2024 bid. I've got mixed feelings about Olympics, but if Toronto gets it, #hamont has to be included. The Olympics Agenda 2020 now encourages the usage of pre-existing venues where possible, reducing the pressure for Sochi/Beijing style gigabudgets. It is also noteworthy Tim Horton's field (with south end zone bleachers) is bigger than London's smallest of six olympic soccer stadiums. So we're already 'ready' at a low budget. Even without TO2024, it is noteworthy that the shelter-less Exhibition GO platform was a platform built for the Exhibition stadium too. We would simply be copycatting the Exhibition platform in this particular case. Such a basic unsheltered platform can cost less than $1M to add; and only for south-side tracks for now (to eliminate pedestrian crossing), and only run during special events. Great article. I've only been in Hamilton for 10 years - was wondering if anyone can give me background on why VIA left for Aldershot? I'm racking my brain but can't think of another instance in Canada where a city with 500,000+ people doesn't have a VIA station within its physical boundaries. I realize Aldershot is close, but bottom line, it's not here - why doesn't VIA stop here on its Niagara Falls line? It's an Amtrak style move. If you read the history of the decimation of train service, there was a lot of consolidation of train service to fewer stations that are cheaper to operate. If you know the history of the train service cutbacks of the 1950-1980s due to the boom of airplane flight, many cities merged train stations into one station. So, VIA merged Burlington Station, Dundas Station, and Hamilton Station into one stop at Aldershot. We held out far longer than many American cities, and only finally consolidated after the 1991 recession; a lot longer. But we weren't the only city to get this consolidation; if you study the history of train cutbacks, you will recognize the Aldershot pattern all over North America. Part #2 of this series (Niagara Seasonal Trains stopping in #hamont as early as 2016) is currently ongoing. I promised it would have been last week -- but several things have happened to bump the deadline. Hang in there! Errata #2: New information I have received is that the West Harbor parking structure won't tower as high as expected. The crane, in fact, has now been taken down. It's possible they are phasing the parking plan differently than old media articles suggest (where many articles mentioned a 300-car parking garage; which would need multiple stories, for such a narrow parking garage). Instead, 300 cars is spread between the parking structure and the surfaced parking at this time. Confirmed. The initial 300 car spots are divided between the structure and the surface parking lot. This is in contrary to earlier media reports (CBC, TheSpec, RTH, etc) that this was going to be a 300 car parking structure. New Metrolinx PowerPoint for upcoming September 22nd board meeting. (Page 7) • Dialogue underway with CN concerning additional infrastructure requirements to support RER and the new Confederation GO station in Hamilton. (Page 8) Lewis Road Layover (Stoney Creek): Construction progressing toward Summer 2016 completion. Note: Confederation GO station is planned official name of the Stoney Creek GO station, since there is another GO station named "Centennial" that conflicts with Centennial Parkway. Can't they just call it "Stoney Creek"? I would guess because it's not in Stoney Creek. Any future station to the east would be in Stoney Creek, so it makes sense to save that name for when it is applicable. I find it infuriating that Via Rail doesn't stop in Hamilton. Any plans to change that any time soon? For readers not aware, Part 2 of this GO Series is now published as of October 7th, 2015. "An existing Niagara GO train passes West Harbour GO without stopping: 16 trains per weekend, eight toward Toronto and eight toward Niagara. Can they stop in Hamilton in 2016?" if the government were serious about transit they would expropriate the necessary line(s) so that GO trains would have priority or at least equal footing to the freight trains. My son was taking the train back from Sudbury and was hours late because the passenger train had to wait for the CN or CP freight trains to finish using the track. Over the years the various governments have expropriated land for a variety of uses but transit just isn't a priority, like electricity or roads or water.